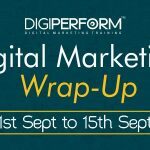 Welcome to Digital Marketing News by Digiperform! Online marketing is a vast industry that keeps on evolving. It’s not easy to keep a track on each and every update. Therefore it’s our obligation to keep you updated about the latest happenings and trends through our digital marketing news section. Let’s out the latest updates of this week. Recently Snapchat has appointed former CMO of Timer Warner’s as its new Vice President of US Global Business Solutions. O’Hara will oversee the company’s US-based sales leaders and directly report to Snap Chief Strategy Officer Imran Khan. The motive to hire Kristen to oversee sales leaders as well as their relation to building advertisers and helping marketers on the platform to drive bigger results via the Snapchat platform. While creating a channel between Snap’s chief strategy officer and the Business Solutions group, Kristen will be responsible for the East Coast, West Coast, and Central Business Solutions teams. Before Snapchat, O’Hara led Time Warner’s marketing team behind the $100 million deal with Snapchat to create shows and ads. “Snapchat is a platform that offers marketers an unmatched combination of authenticity, creativity, and scale. I’m excited to help brands unlock the true power of the platform to drive their business,” says O’Hara. We wish you a great luck for the role Kristen! Update 2: Facebook launched new Flight Ads to target users searching for flights. Flight Ads (previously known as Dynamic Ads) recently launched by Facebook for travelers who look for the flight on travel sites. These new ads will let airlines and airfare apps go beyond simple remarketing targeting and tactics. Along with that Flight Ads will allow airlines and airfare apps to target their ads based on a user’s visits to flight-related Facebook Pages, websites and apps outside of the advertiser’s web properties and Facebook Page. However, the limited number of advertisers are allowed by Facebook to try out this new feature including Air France and Hopper, an airfare app. After trying this new feature, Air France experienced sudden 66 percent drop in costs per search where ads drove to target the search volume to its website. On the hand, Hopper examined the drop in install costs and a great lift in the engagement rates. Facebook has confirmed that the Flight Ads will be available globally to all advertisers in the coming weeks across its platform, Instagram and its Audience Network. YouTube is retiring its Director Onsite Services as of October 31 that was first launched in June 2015. From now, YouTube even has stopped accepting new applications for video ad production that been expanded to more than 170 US cities in March of this year. Through the Director onsite program, companies that committed to spending at least $350 on YouTube via Google AdWords would have access to professionals who would script, shoot and edit a 30-second video ad at no charge to the advertiser. Instead of Director onsite, YouTube is recommending advertisers to check out its YouTube Playbook for Small Business and third-party services as alternative resources. According to a YouTube spokesperson, Youtube has been rolling out tools and features focussing on SMBs to do more video ads this year. This new announcement would help advertisers to focus on building on video ad metrics and tools for creators which would in return provide the ability to live stream broadcasts from a desktop. This would definitely give creators more ways to monetize their content. Update 4: Twitter launched Audio Podcast feature for its iOS and Periscope users. On Friday, Twitter launched a new audio-only broadcast feature for its iOS users and Periscope. As per the platform, the user has been requesting to provide an option to broadcast without showing their surroundings. The update also comes at a time when audio podcasts are becoming more popular as a medium for both broadcasters and marketers. As per the spokesperson, Now, in addition to “Go Live”, there is an option to click “Enable Audio Broadcast Only”. After recording an audio broadcast, users can choose to share, save or delete it. We’re launching audio-only broadcasting, so your followers can hear, but not see you. Facebook has recently renamed Canvas Ads to Instant Experience Ads giving users building out pixel capabilities around the newly named ad product. These ads can be used in retargeting campaigns. The Instant Experience Ads will now automatically attached to a Facebook pixel which makes it possible for advertisers to use Pixel on their website. This update will help to re-engage with site visitors that interacted with the ads on Facebook. The platform is allowing advertisers to embed third-party pixels in their newly named ads to track campaign performance and compare against other campaigns using their choice of respective analytic tools. “We are also introducing new ways for businesses to understand their customers’ progression from seeing an Instant Experience to completing a purchase, and opening new opportunities for businesses to re-engage with those customers,” writes Facebook on its business blog. According to Facebook, the number of Instant experience ads has doubled over the past year where it loads 15 times faster when compared to standard websites. Let us know if we have missed any update for this week, we would be happy to add in our list. Happy Marketing!